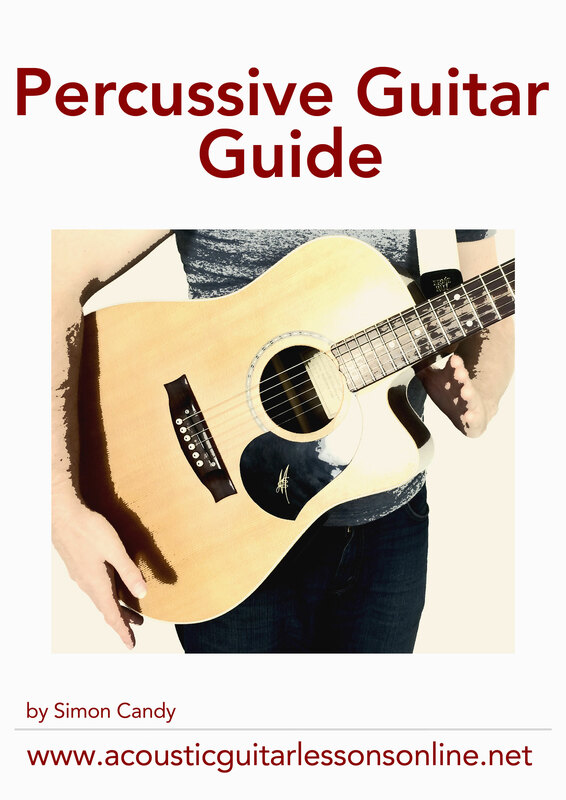 On this page you will find many free acoustic guitar resources, covering a range of topics including fingerpicking, percussive techniques, chord approaches, and much more, all designed to help you improve greatly with your own acoustic guitar playing. How To WOW Your Audience With Walking Bass Lines On Your Guitar! BRAND NEW! How would you like to pick up your guitar, and within seconds of playing, have your audience totally mesmerised, hanging on your every note? If this sounds cool, then let me show you the epitome of cool in the jazz world with walking bass lines. Typically played on a bass, walking bass lines sound equally as good, if not better on a guitar. Why? Because on a guitar you can play the walking bass line for a progression and the the chords too! The result is truly amazing when you realise you are sounding like a jazz rhythm section on one guitar! 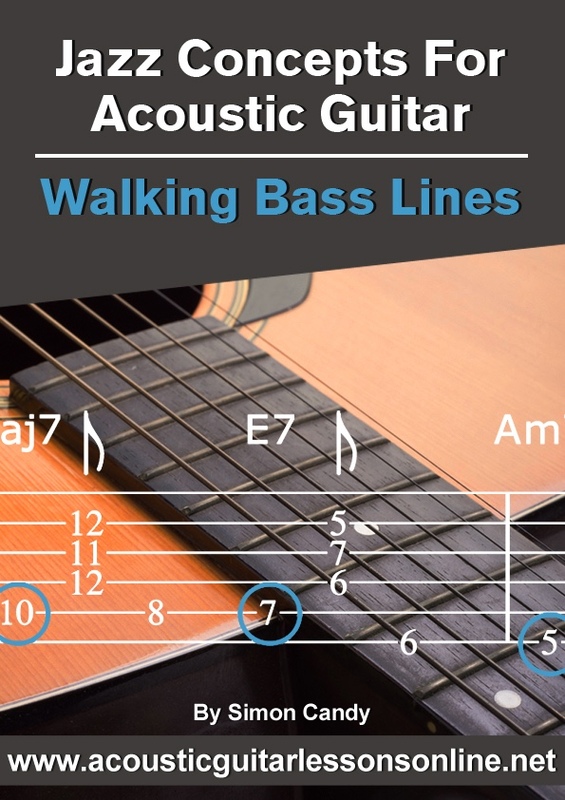 Discover how to create amazing chord progressions using walking bass lines on guitar with this ebook/audio. NEW! Boring and stale are two words you don’t want to use when describing how you feel about your guitar playing. However, like it or not, we all have felt this way about our playing at one time or another. It’s just how it is. Or at least that’s what we tell ourselves as we continue to plod along hoping to somehow turn things around. Whether you feel this way about your guitar playing right now or not, I am going to show you a very cool way to create totally unique sounding solos on your guitar. 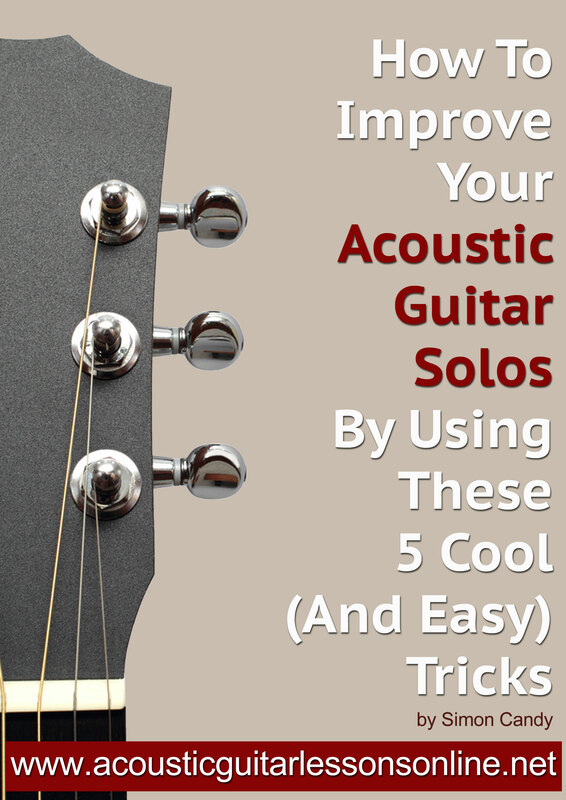 This approach will be a game changer as far as your soloing on the instrument is concerned. All you need are, your fingers, pentatonic scale patterns, and open strings. NEW! 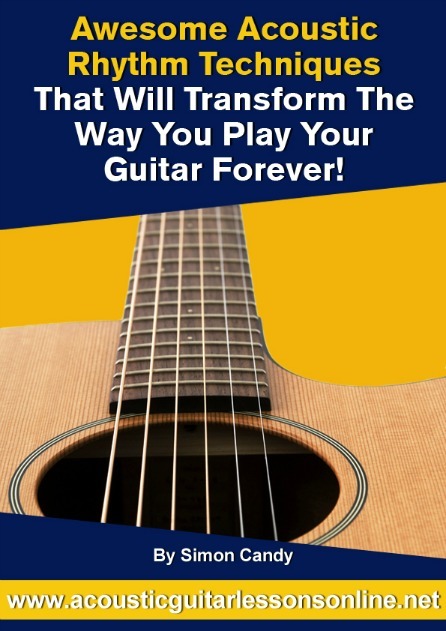 Picture yourself picking up your guitar and having the ability to perform complete arrangements of songs, playing both the chords and the melody at the same time! 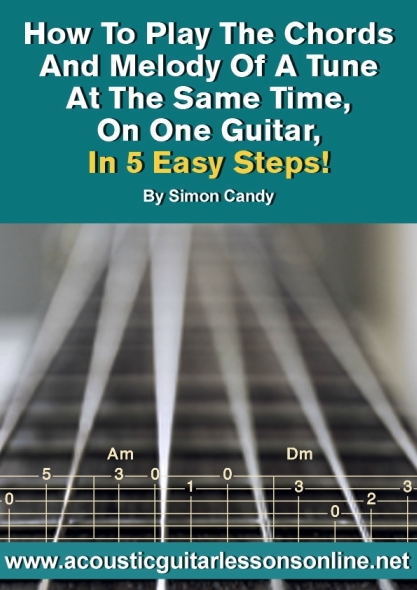 Not only is this one of the more impressive things you can do on guitar, it’s also one of the more rewarding as you don’t need to be playing along with any recording, or other musicians to sound full and complete. Many guitarists try to play this way, but fail, giving up, believing they just aren’t good enough. The key however, is in having a strategy to break down the process of playing multiple parts of a song at the same time. It really isn’t hard to do, you just need to keep things simple. 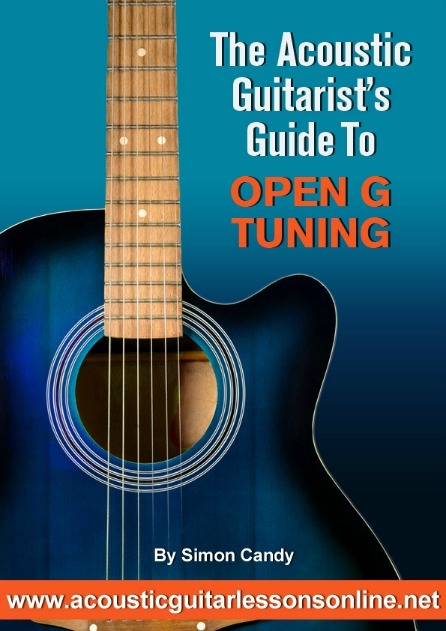 Learn how to create amazing music using the open G tuning on your guitar. If you have at least basic playing skills you will be up and going in this tuning immediately, sounding like you’ve been using it for years. Fact is, open tunings set your guitar up in a way to make it EASIER to play certain things, things that are next to impossible to do in standard tuning. This is not to say standard tuning is no good, of course it is, and is why it is the “standard” tuning amongst guitarist’s. However limiting yourself to one tuning is to limit your creativity and the potential sound you can get on this great instrument. 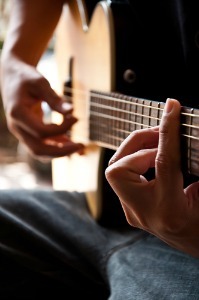 Feeling like you’re in a rut with your solo guitar playing? Sick of always playing the same old stuff when you improvise a solo? Don’t know where to turn to next? Every guitar player hits this point in their solo playing life, and it often requires you to look outside of your “comfort zone” regarding the styles and genres of music you play and listen to, to find some answers. Check out these jazz guitar arpeggios for your playing and get ready for your soloing to take on a whole new, exciting, and creative direction! How many chords do you know on your guitar? Now, how many of these chords can you actually use creatively in a musical context? The second of these questions is by far the more important one. The answer to the first question is actually irrelevant as who really cares how many chords you know on guitar if you can’t actually use any of them musically, right? 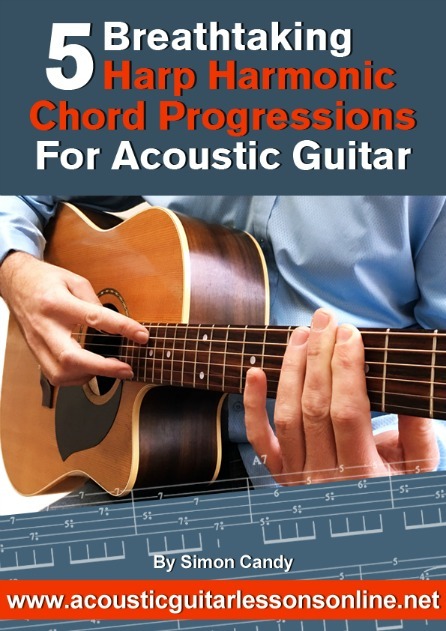 Check out 3 very creative ways you can use these jazz chord shapes for your acoustic guitar. Don’t like jazz, it doesn’t matter, you will be able to use these chords in any style of playing. Get ready to be blown away with the amazing, mesmerising and breath taking sound of harp harmonics. This technique will be one of the most unique, creative, and impressive things you will ever do on your acoustic guitar! 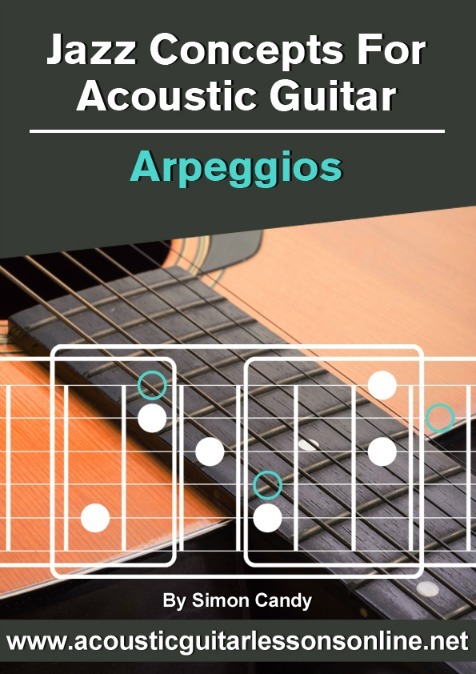 To get started I am going to show you 5 harp harmonic arpeggio patterns and approaches you can apply to the chord progressions you play on your guitar. You will be able to use these ideas again and again whatever style of music you play. Did you know it is estimated that only about 1/6 of chords that are possible on a guitar are available to you in standard tuning? 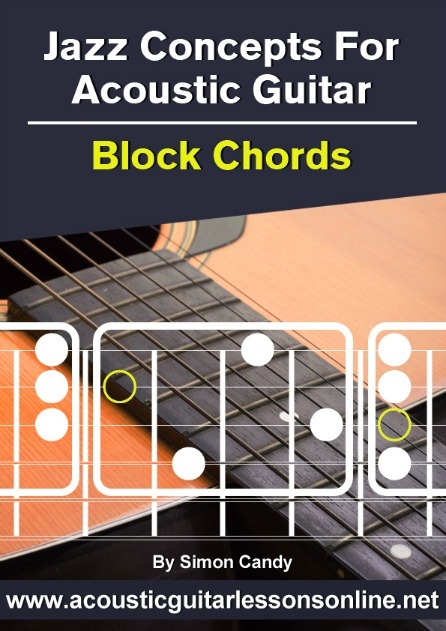 This means you are missing out on up to 5/6 of the chords and sounds possible for your acoustic guitar playing? That’s a lot of sound and creativity left undiscovered! Don’t do what I did and avoid any kind of alternate tuning for your guitar playing. Let me show you just how easy it is to start sounding great, right now, today, using the magical tuning of DADGAD for acoustic guitar with this ebook/audio. Learn some awesome and unique approaches to playing rhythm parts on your acoustic guitar. This is an often overlooked area for most people, however it is what we do the majority of our time when playing guitar. To have the ability to make your chord progressions sound unique and amazing every time, check out these awesome acoustic rhythm guitar techniques for your playing. We all love stuff that sounds cool and is easy to play on our guitar. 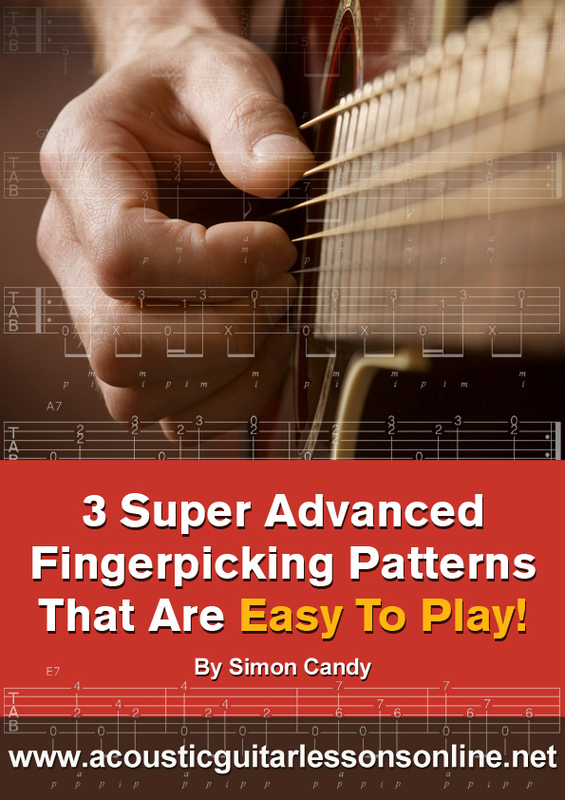 Thankfully there are many things that fall into this category including these 3 great sounding fingerpicking patterns for your acoustic guitar playing. Not only will you learn these patterns, but I will also show you exactly how to apply them to your playing so you can use them over and over again, in many different ways, sounding awesome everytime! 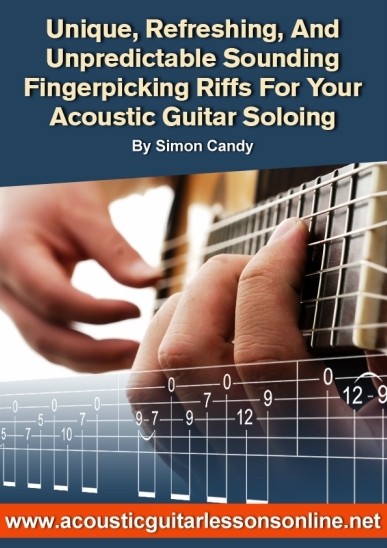 Check out these advanced sounding fingerpicking patterns for your acoustic guitar playing. Too often the focus is on soloing with guitar players. While this is important, the rhythm side of things is just as important to you as an acoustic guitarist. Learn how to effortlessly play your acoustic guitar rhythmically without sounding the same way, doing the same old boring stuff, all the time. One of the coolest and most impressive things you can do on your acoustic guitar is to play it percussively. This has become an increasing popular thing to do on the acoustic guitar over recent years, and with good reason; it sounds abcolutle killer! Nothing quite compares to the sound of someone fingerpicking blues on an acoustic guitar. 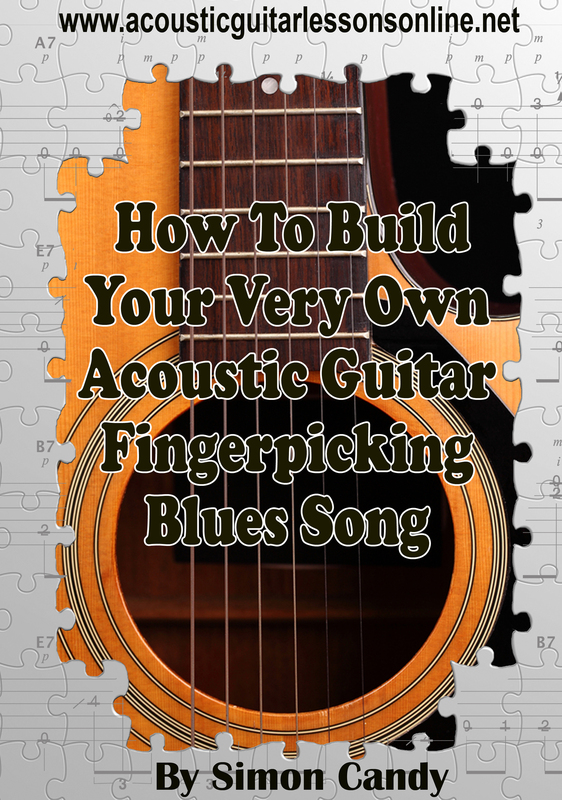 How would you like to have the skill of picking up your acoustic guitar and fingerpicking endless variations of the blues wihtout needing anyone else to play along with you? Banjo rolls create great licks on the acoustic guitar. 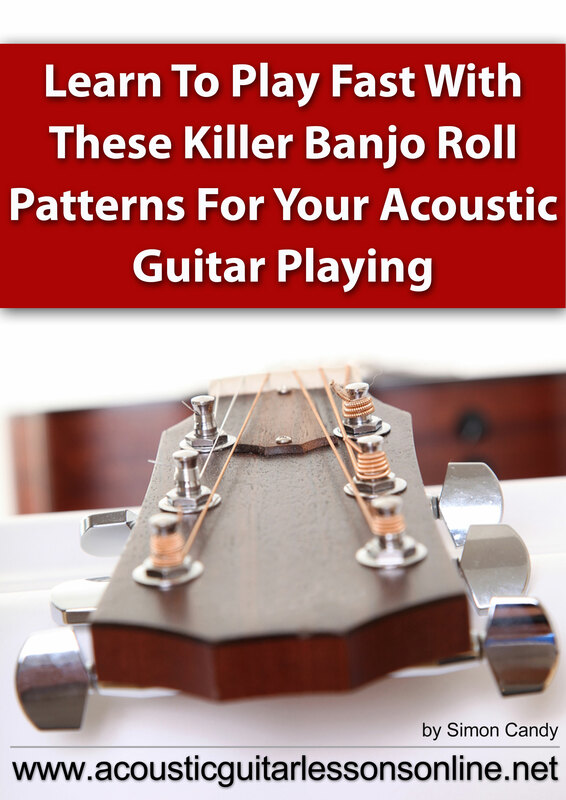 Furthermore, banjo roll patterns can create killer solo lines on the acoustic guitar. WIth just a few simple variations of the banjo roll technique under your fingers, you can be running up and down the fretboard of your acoustic guitar, reeling off very cool, fast, fluent lines. 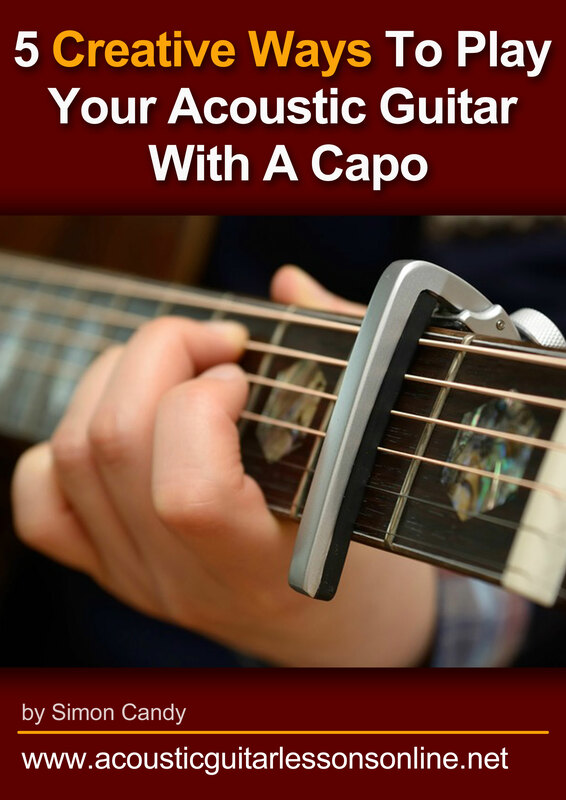 Most acoustic guitar players fail to realise the full potential of the capo. This is an essential stylistic tool for an acoustic guitarist. There are many cool and unique ways you can use a capo to enhance your guitar playing. Learning a song from the very beginning and progressively making your way through until the end is NOT the way to go about things when getting tunes down on your acoustic guitar. Fact is, there are several proven methods and strategies that are far more effective in getting songs down, that will help you avoid the endless frustration that can often lead you to give up, believing it's all too hard. To only use chords for rhythm playing on your acoustic guitar is a waste, leading you to only realise half their potential. 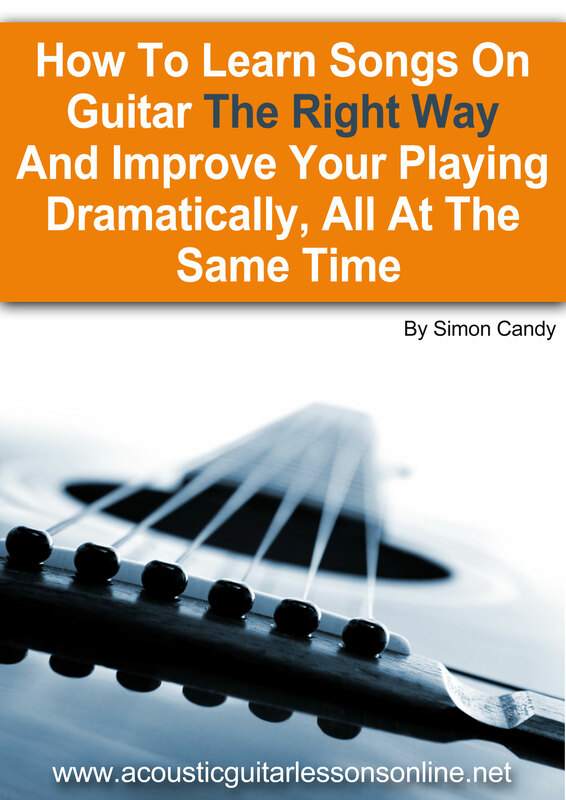 Chords are also a great tool for soloing and provide great contrast with the single note lines you play. One of the greatest things to be able to do as an acoustic guitar player is to sit back and play through a tune covering all the parts yourself, on the one guitar. Yes that's right, the bass, the harmony/chords, and melody parts all at the one time! Take it form me, this is an extremeley satisfying thing to be able to do on the acoustic guitar, and people absolutely LOVE to hear arrangements of songs done in this way. 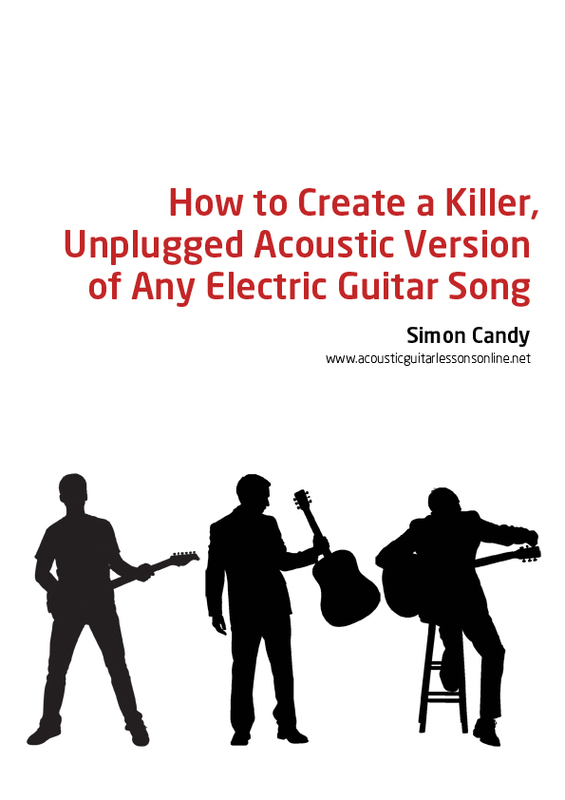 If you've ever seen awesome renditions of songs done in this way on youtube or similar but have thought it's way too hard for you to even try, then you need to check out this ebook/audio on creating your own acoustic instrumental versions of songs. 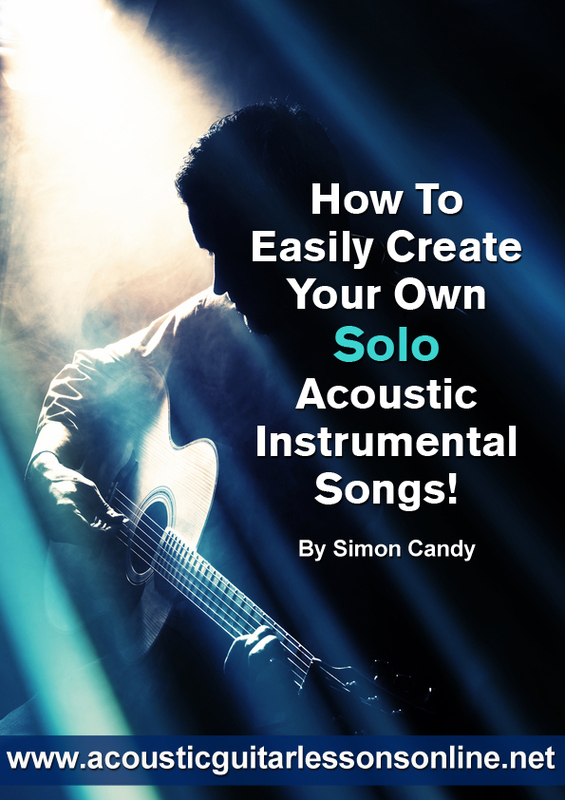 I'll give you 3 very effective templates you can use again and again to create you own awesome sounding instrumental versions of songs on your acoustic guitar.